Demetrios Poliorketes (Besieger) installed a garrison at a fortress on the top of the Hill of the Muses (Philopappos), dubbed as Macedonian fortress (294 B.C. ), whereas almost at the same time the Athenians construct along the ridge the so-called, 850-metre-long diateichisma that reduces considerably the perimeter of the walls; the defence at the steep Hill of the Pnyx is also reinforced in the early 2nd c. B.C. Gradually, the once-upon-a-time inhabited western section of the Hills is transformed into a cemetery that remains in use from the 3rd c. B.C. until the 3rd c. A.D. A total of 175 unlooted graves have been excavated. Thompson and Scranton 1943, 301–362; Dakoura-Vogiatzoglou 2008, 258–259. 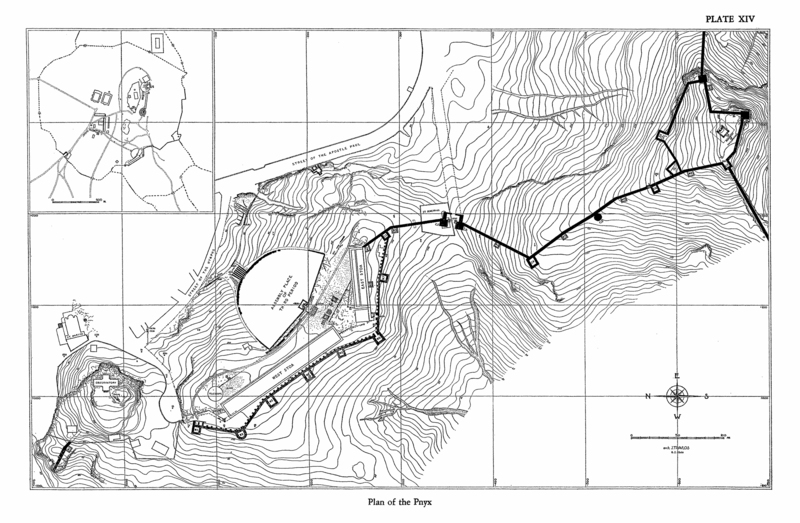 Topographic drawing of the Compartment Wall (diateichisma) on the Western Hills of Athens.